Dr. Dan Blumstein from UCLA’s Ecology & Evolutionary Biology discusses the sound of marmot fear, mathematically of course. 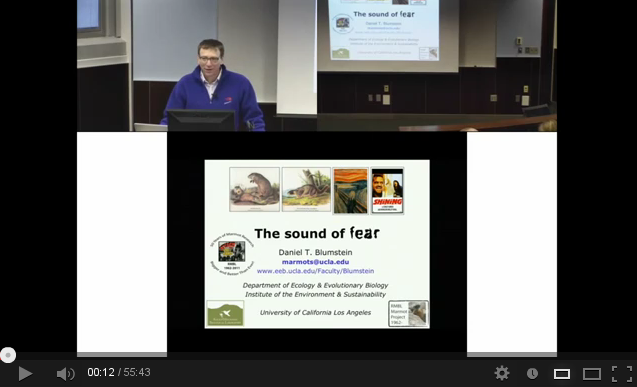 We are pleased to begin offering the audio and video recording of NIMBioS’ Interdisciplinary Seminars, beginning with Dan Blumstein’s talk about marmot vocalizations. If you missed “The sound of fear: A journey from marmot meadows to Hollywood” on Jan. 17, which was somewhat disrupted by the freak Knoxville snowstorm that afternoon, it can be viewed in its entirety on NIMBioS’ YouTube channel here. More details about the seminar, including the abstract, can be found here. This entry was posted in seminars, video, Wildlife and tagged seminars, video, wildlife. Bookmark the permalink.